A new study estimates the masses of the seven Earth-like planets, which provides insights on what their atmospheres and surfaces may be like. T	T	he seven Earth-size planets around the distant star TRAPPIST-1 are "tugging" on each other as they travel around their parent star. By carefully observing those tugs, scientists were able to gather information about the planets' composition and found that some of the TRAPPIST-1 worlds could have as much as 250 times more water than the amount in all of Earth's oceans, according to a new study. 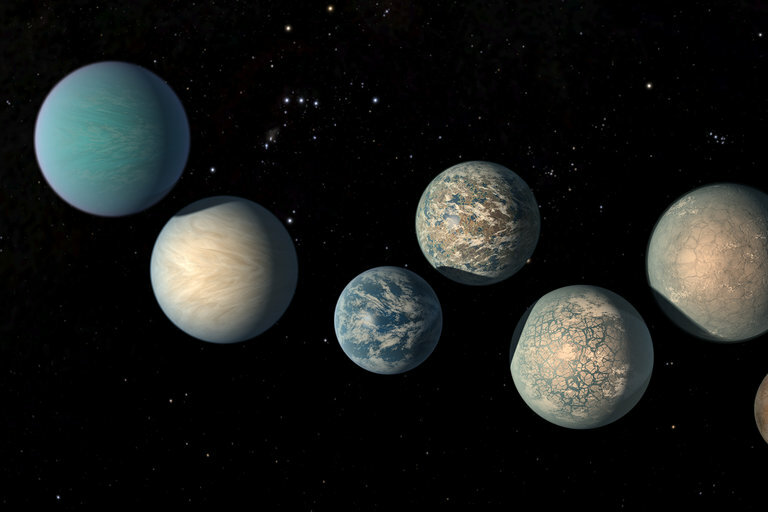 Intriguingly, they found that each of the five lightest planets could have about 250 times more water than the amount in Earth's oceans, according to a statement from NASA. Up to 5 percent of their composition could be water, whereas only 0.02 percent of Earth is water. TRAPPIST-1c, d, and e lie close to the star's "habitable zone," or the region where a star receives enough radiation that water might be able to exist as a liquid on its surface. TRAPPIST-1b, the innermost planet, and TRAPPIST-1c likely have rocky interiors and atmospheres denser than Earth's, according to the study. 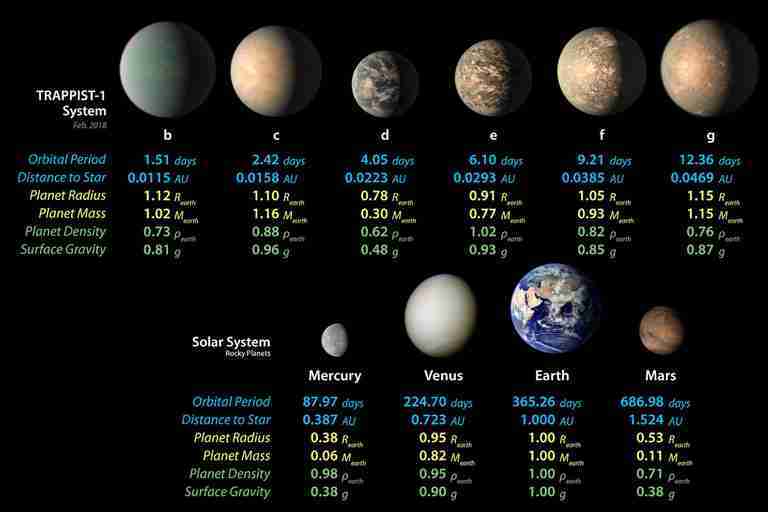 Of all the TRAPPIST-1 exoplanets, TRAPPIST-1d is the lightest, at about 30 percent Earth's mass. This may mean it has a large atmosphere, an ice layer or an ocean, but scientists cannot yet discern that. TRAPPIST-1e is likely a rocky planet with a thin atmosphere. TRAPPIST-1f, g, and h are so distant from their parent star that their surfaces are probably covered in ice. "We were able to measure precisely the density of exoplanets that are similar to Earth in terms of their size, mass, and irradiation, with an uncertainty of less than 10 percent, which is a first and a decisive step in the characterization of potential habitability," said Brice-Olivier Demory, a professor at the Center for Space and Habitability and co-author of the study, which was published in late January 2018 in the journal Astronomy and Astrophysics. The exoplanet TRAPPIST-1e yielded another interesting finding: It is the most similar to Earth in the amount of radiation it receives from its parent star, its size, and its density. And liquid water could exist on its surface. "We now know more about TRAPPIST-1 than any other planetary system apart from our own," said Sean Carey, manager of the Spitzer Science Center at Caltech/IPAC in Pasadena, California and co-author of the new study. "The improved densities in our study dramatically refine our understanding of the nature of these mysterious worlds." There is still much to learn about the TRAPPIST-1 system. Knowing a planet's density doesn't necessarily tell scientists what it's like on the surface of those planets. For example, the moon and Mars have the same density, but their surfaces are very different, according to the NASA statement. More precise findings about the TRAPPIST-1 planets' atmospheres and compositions can be obtained from upcoming projects, like NASA's James Webb Space Telescope, which is scheduled to launch in 2019.